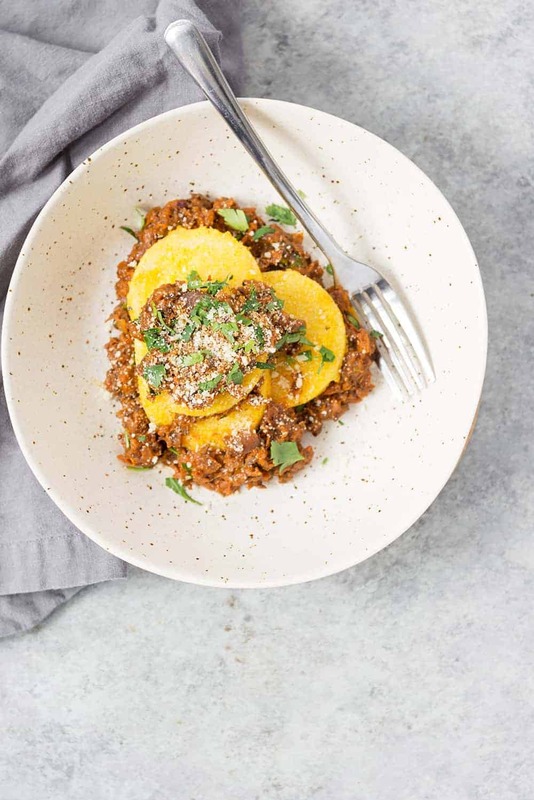 Polenta bolognese dinner, coming right up! Doesn’t this bowl look so warm and comforting? It’s plant-based dining at it’s finest. 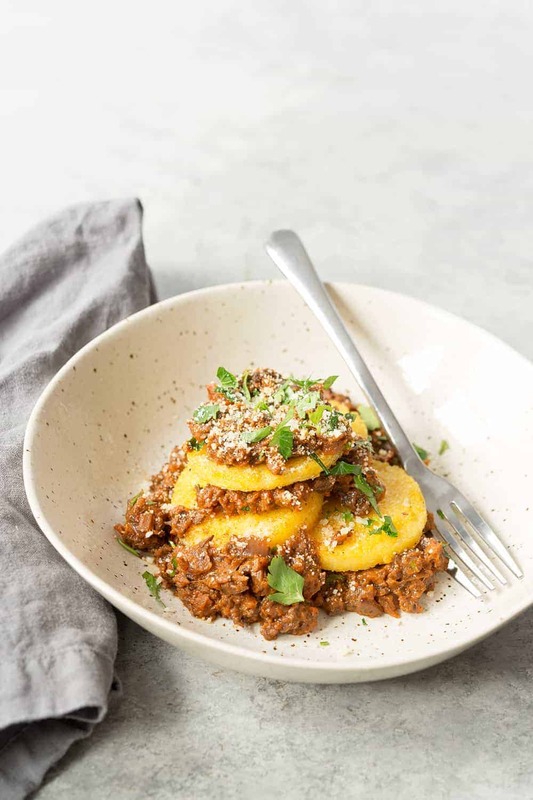 Crispy polenta topped with a quick mushroom bolognese. Did I mention this one is done in only 30 minutes? This gorgeous recipe comes from my friend Serena and Deanna’s new cookbook, The 30-minute Mediterranean Diet Cookbook. Complete with a introduction of the mediterranean diet and 101 easy recipes for breakfast, lunch, dinner, sides and desserts. While it’s not completely vegetarian, there are plenty of veg-friendly recipes and a cookbook I’ve been cooking out of for the last few weeks. The perfect cookbook gift for the upcoming holidays. 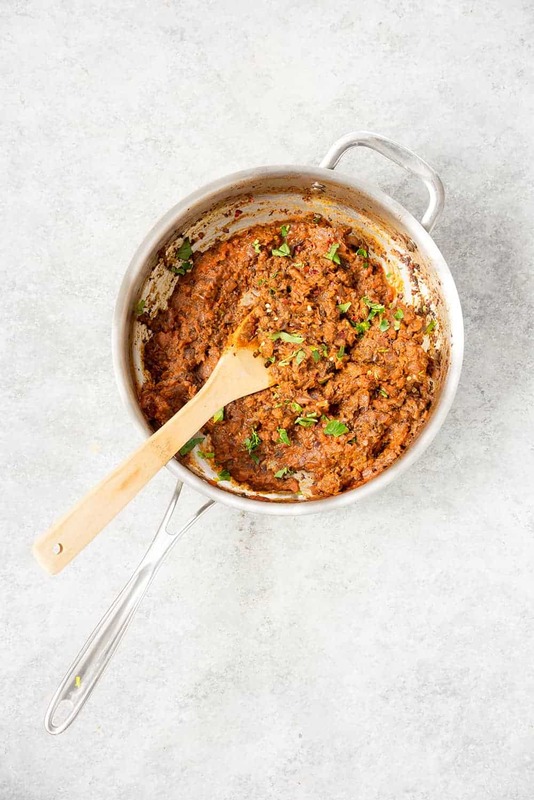 This mushroom bolognese recipe is one of my new favorite dinners. I honestly couldn’t believe how quickly it cooked up, and how creamy the sauce is. The original recipe called for whole milk, but I subbed in soy milk to keep this one plant-based. I’ve never added milk to my sauce before, but was pleasantly surprised on how it made the sauce richer, a yummy component to creamy polenta slices. If you love vibrant, produce-heavy meals, then you’ll want to check out The 30-Minute Mediterranean Cookbook. Since I love this gorgeous cookbook so much, I’m giving a copy away to one of you! Want to win? Leave a comment below, letting me know your favorite Mediterranean dish! 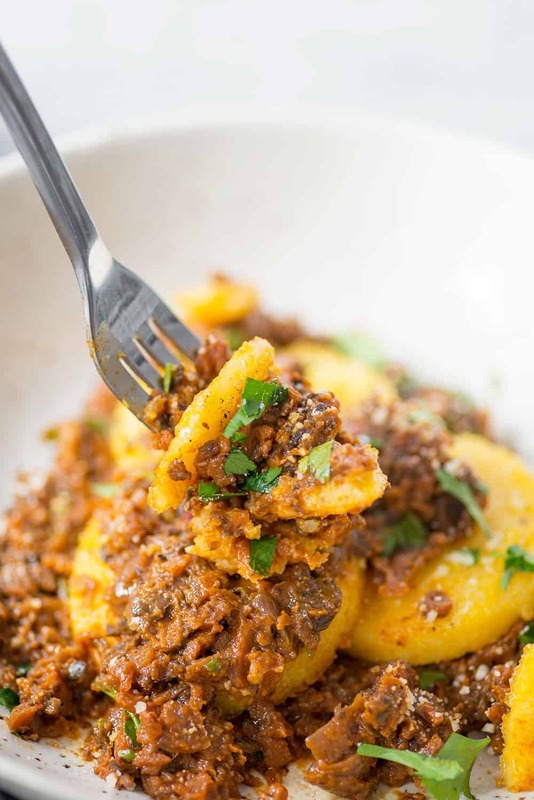 Polenta with Mushroom Bolognese! 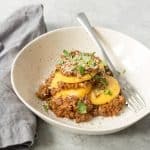 This healthy vegetarian or vegan dinner is so delicious– comfort food at its best! 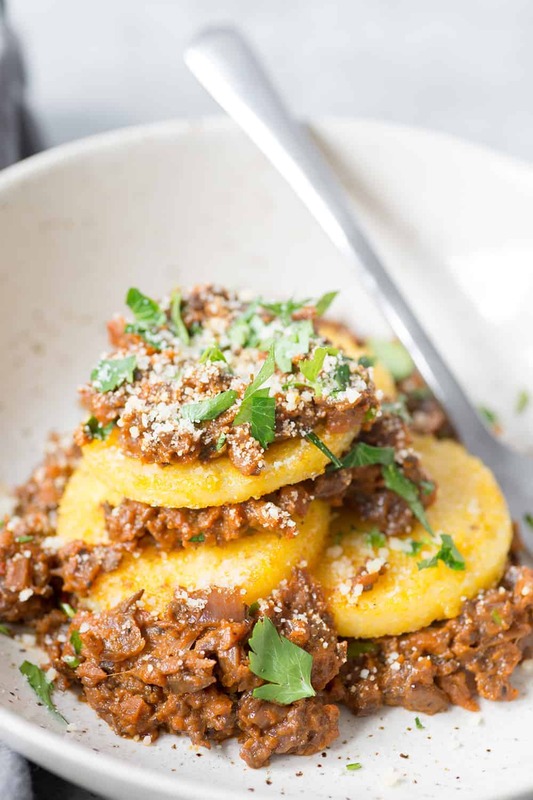 Crispy polenta rounds with mushroom bolognese sauce. Ready in just 30 minutes! In a large stockpot over medium-high heat, heat 2 tablespoons of oil. Add the onion and carrot and cook for 5 minutes, stirring occasionally. Add the mushrooms and garlic and cook for 5 minutes, stirring frequently. While the vegetables are cooking, add the remaining 1 tablespoon oil in a large skillet and heat over medium-high heat. Add 4 slices of polenta to the skillet and cook for 3-4 minutes, until golden; flip and cook for 3-4 minutes more. Remove polenta from the skillet, place it on a shallow serving dish and cover with aluminum foil to keep warm. Repeat with remaining 4 slices of polenta. To the mushroom mixture, add the tomato paste, oregano, nutmeg, salt, pepper and stir. Continue cooking for another 2-3 minutes, until the vegetables have softened and begin to brown. Add the wine and cook for 1-2 minutes, scraping up any bits from the bottom of the pan while stirring with a wooden spoon. Cook until the wine is nearly all evaporated. Lower the heat to medium. Meanwhile, in a small, microwave-safe bowl, mix the milk and sugar together and microwave on high for 30-45 seconds, until hot. Slowly stir the milk into the mushroom mixture and simmer for 4 more minutes, until the milk is absorbed. To serve, pour the mushroom veggie sauce over warm polenta slices. My favorite Mediterranean dish is falafel. My fav dish is Tabouli salad but this one looks amazing! Can’t wait to try this- sounds yummy! Sounds silly, but I love the classic juicy tomato, out of the garden basil and fresh mozzarella combination. Sliced on a plate and drizzle it with local olive oil from Spain, sprinkle with sea salt, and you’re in heaven. Sometimes simple is so delicious! My favorite Mediterranean dish would be a lentil and quinoa tomato sauce with mushrooms over spaghetti squash. Delicious! Thanks for the support Teresa! Glad you attended the webinar! Would love to try this recipe, but right now favorite vegetarian recipe is Tabouli salad! I love anything with lentils or quinoa. I also love the fresh seafood of the mediterranean. So much good stuff! Congrats Chloe! You are the winner! I’ll email you with more details. Awesome!!!! What a day maker! Thank you! I love couscous salad and grape leaves. I’m going to try this. Thanks, and good luck to everyone with the giveaway! You can never have too much hummus. Nice. My mom often has vegan food cause of her health, I’ll try this for her. Thanks for the post. Thanks for sharing this great recipe! It’s very useful for me. I will try it today. So glad you liked it! Thanks Judith!